It’s been awhile since my last post and I’m thankful to have a few minutes to write a little. The past several weeks have been a series of rewarding, interesting, frustrating and exciting days filled with what has become my temporarily bifurcated life. Living in an old (1876) house is an adventure sometimes, and what began as a “remodel and update the bathroom” project has now become a major renovation complete with new plumbing, wiring, heating runs, and foundation work. I’m thankful for the privilege of citizenship in this wonderful, maddening, inspiring, beautiful country of ours. Even with all our mistakes our better angels still triumph over our inner demons most of the time. I’m thankful for my colleagues far and wide and especially for my long-time collaborators in Midwest Consulting Group. As one of the first virtual corporations in the Midwest, MCG has become a wonderful team of “neat to hang out with” friends and co-creators. I’m thankful for my family and the home we have built together. The love and support of my wife Susan has been the rock upon which I’ve been able to build my professional life for 35 years. 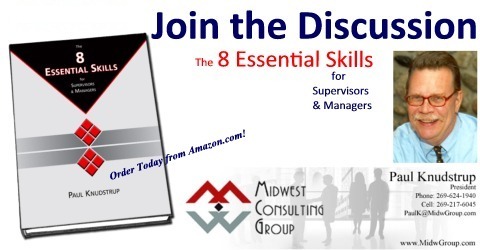 I’m thankful for the success of The 8 Essential Skills for Supervisors & Managers since it’s publication earlier this year. We know we’ve hit the target when we keep hearing the same feedback over and over again from readers. The book is easy to use, easy to read, and it is filled with practical ideas that work. The real thanks for this goes to my editor Jan Andersen of Beyond Words, Inc. who turned my raw words into a very readable finished product. I’m thankful for our clients. They challenge us to help them grow, improve, succeed, and reach their potential as an organization. We are proud to work with them. Over the years we have met, come to know, and enjoyed the emergence of a host of new leaders in all kinds of organizations. I’m thankful to have these few minutes of your time. What are you thankful for today?